Artists are political animals. Often their artistic production concerning current events seeks to delve deeper than mere reflection. This is where the fun, and frequently the paranoia, begin. This exhibition critiques the present, but avoids being dated by offering a retrospective of artworks going back to the Cold War era. There are the usual suspects who have carved a niche for themselves in this genre: Emory Douglas, Jenny Holzer, Mark Lombardi, Avram Finkelstein, and Peter Saul. But it is the works that hinge on the personal that affect the most. 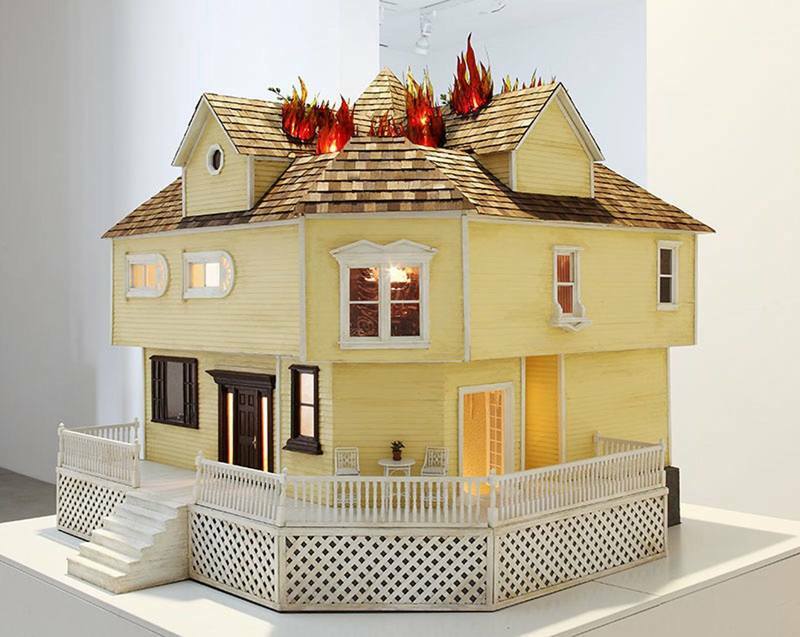 Sarah Anne Johnson's cycle of sculptures based on her grandmother's suffering as a victim of the MK-Ultra experiments culminates in the endearing yet nightmarish House on Fire (2008). Rachel Harrison's immersive installation Snake in the Grass (1997) is a disorienting series of grainy photographs, charts, and enigmatic objects representing the cultural juggernaut that is Kennedy assassination conspiracy theories.